This kit has the parts for 6 lumber stacks. Each stack is 4 scale feet wide and 30 inches tall. 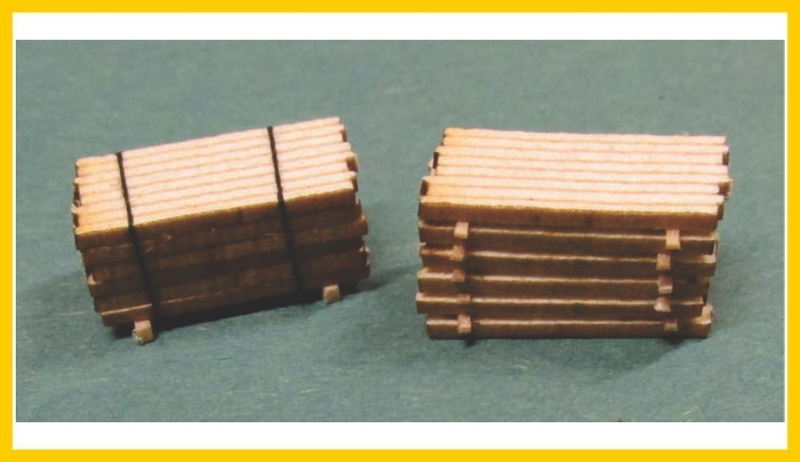 Each stack is made from 6 layers of 1/16 Basswood colored Task board and have staggered ends , with the top and bottom layer being engraved for boards. A good simple evening project that would require no painting if you like , or the ends could be painted for a more modern era stack. Strip wood for stickers are not supplied. Use scale 4x4 under each stack for dried stack and scale 2 x 4 under each layer for a fresh cut air drying stack.